Delicious aromas, popping corks, and festive music were key ingredients for a vibrant atmosphere at the second Memphis Food & Wine Festival Celebrity Chefs’ Dinners November 28th at Interim Restaurant. This venue’s open kitchen offered the sold out crowd a great visual of a well-choreographed four-course meal. 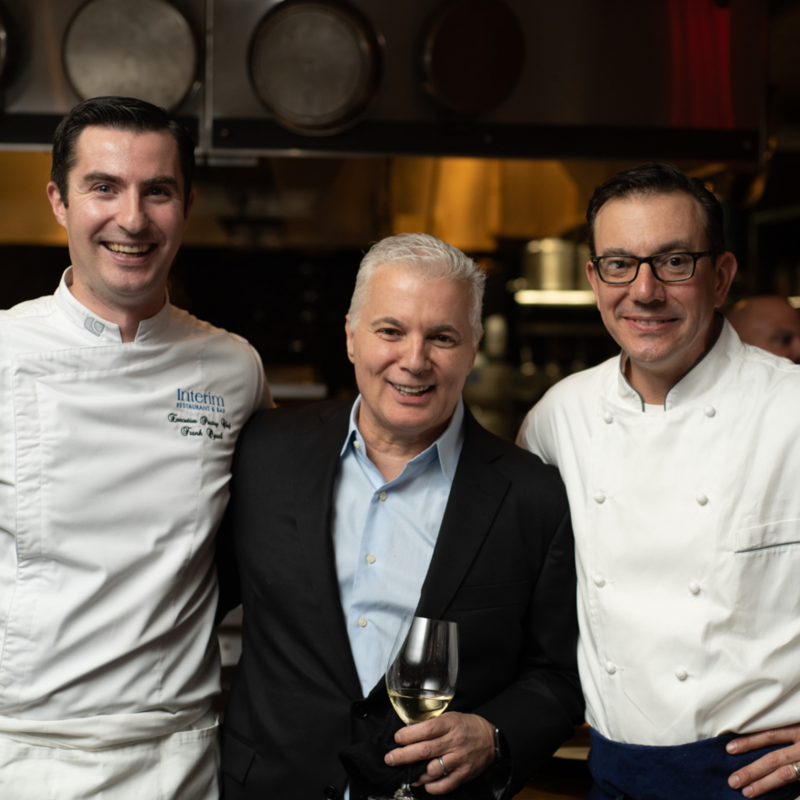 "Dinner guest and Celebrity Chef's Dinner #3 (January 24, 2019 at Erling Jensen) sponsor Jonathan Ellichman summarized the atmosphere best - "the music – the people – there was an energy in the room. If I didn’t know any better, I would have thought I was in a bistro on the upper east side in NYC." 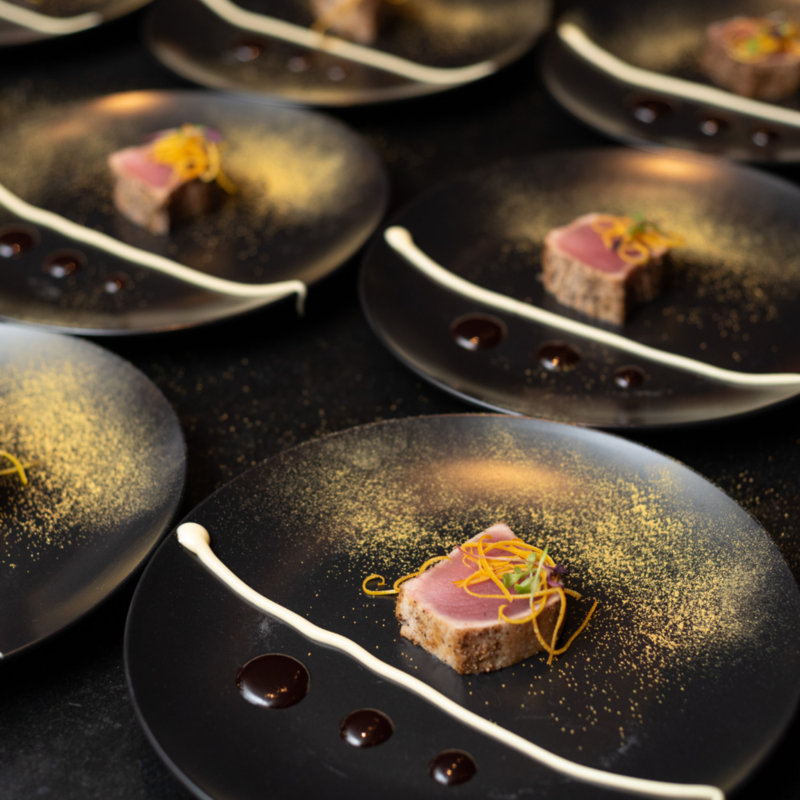 Host Chef David Krog worked alongside Guest Chef Dominic Orsini (Silver Oak Cellars Winery Chef, Napa Valley), visiting chef Jason Dallas (Spice Kitchen & Bar, Cleveland), and Interim chefs David Todd and Franck Oysel for this special culinary collaboration. The menu included fall ratatouille on parmesan crisp, duck confit with pistachio and pomegranate gastrique, and grilled lamb strip loin with shaved fennel slaw and olive jus. 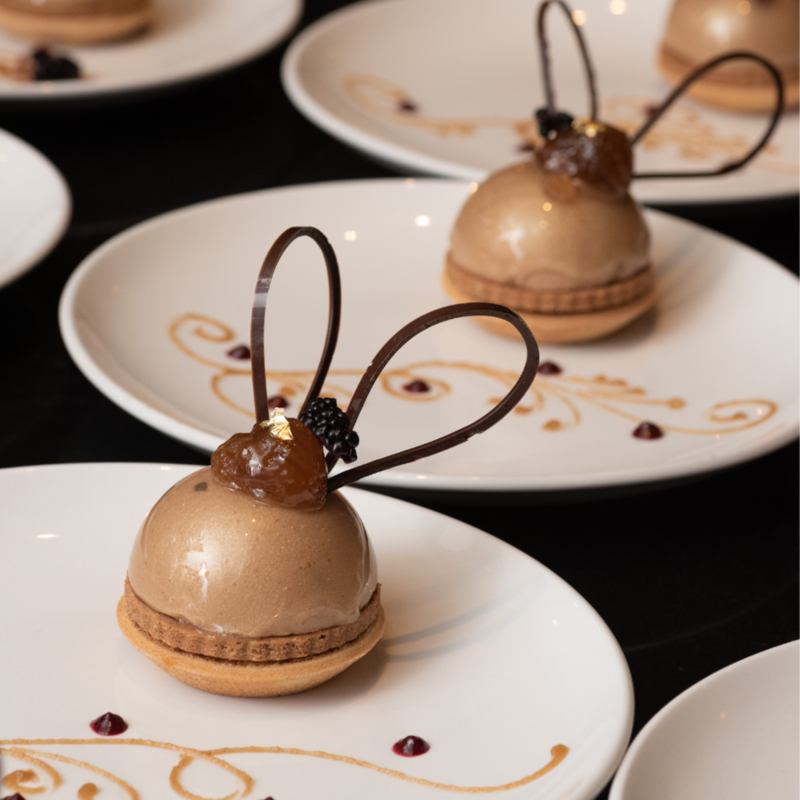 Chef Oysel wowed guests with a beautifully plated hazelnut frangipane tart topped with candied chestnut mousse on a white chocolate crisp with blackberry compote and vingtage aged rhum chestnut cream. Guest enjoyed each course with specially paired Silver Oak | Twomey wines. Special thanks go to sponsors Susan and Alan Graf for a tasteful evening. Since taking the helm as Winery Chef at Napa Valley’s renowned Silver Oak Cellars in 2008, Dominic Orsini has transformed what it means to be a winery chef. With a philosophy centered on creating cuisine designed to enhance the enjoyment of wine, Dominic has expanded the approach by creating a style of cooking that embraces not just the wine, but also the wine country experience as a whole, focusing on the sense of place that is so central to the crafting of fine wine. As Silver Oak’s first Winery Chef, Dominic takes inspiration and ingredients from the seasons as well as the winery’s vineyards, cellars and gardens. He uses vine cuttings to smoke meats, cover crops to make pesto, leftover grape lees to make vincotto, Cabernet to make pâte de fruit, and barrel staves to fuel his wood-burning oven. Almost all of the produce he uses, including olives, herbs, fruits and vegetables, is grown in Silver Oak’s organic gardens. What he can’t use fresh he dries, cans or otherwise preserves. He grows heritage corn for his own polenta and grinds his own flour. The starter he uses for breads and pizza dough was created from 20-year old Cabernet vines on the winery property. With endless curiosity and enthusiasm for capturing both time and place in his menus, Dominic has pushed the boundaries of what it means to cook locally-grown food according to the season. Dominic is a graduate of the Culinary Institute of America and a Level I Sommelier who honed his culinary skills at fine restaurants in New York and Napa Valley. His journey at Silver Oak is chronicled in his new book, The Silver Oak Cookbook: Life in a Cabernet Kitchen, published by Rizzoli and due out in the fall of 2016. Born and raised in Tampa, FL, Chef Dave Krog discovered his love of cooking at an early age. Living with his grandmother, who was diabetic, David began to cook healthy meals for her and soon decided he wanted to become a Chef. After moving to Memphis, TN, at the age of 18, he worked in several different kitchens before enrolling in Memphis Culinary Academy. He then began an apprenticeship under Lynn Kennedy at La Tourelle. Following his apprenticeship, he became Sous Chef of La Tourelle and went on to be the Executive Chef at Madidi, owned by Actor Morgan Freeman and Attorney Bill Luckett, in Clarksdale, MS. Returning to Tennessee in 2005, David has held positions at Bari, The Tennessean, Erling Jensen's The Restaurant, Terrace at River Inn, and as Executive Chef at Interim Restaurant & Bar. He considers himself a Neo Traditionalist, with an emphasis on using as many locally sourced ingredients as possible. Krog has been the recipient of several awards, such as the Great Southern Food Festival Best New National Chef 2001, and the United Cerebral Palsy Silver Spatula Award for Best Appetizer, and has also been featured in Southern Living Magazine, Bon Appetite, Food and Wine, At Home Tennessean, Memphis Commercial Appeal, Memphis Flyer, 4Memphis Magazine, New York Magazine and on Food Network's Best Of and was recently recognized by the Kemmons Wilson School of Hospitality & Resort Management for Outstanding Service. With a heavy heart, he left Interim to devote his time to opening his own restaurant. While in pursuit of his dream and working as a private chef in many of your homes, the idea for his pop-up, Gallery, was born. Krog’s pop-up is gaining a national following, and has been a destination for couples as far as 250 miles away, including food enthusiasts @wheres.the.food.mike.